Fish is a super healthy food which not enough of us have in our diets this year. Salmon is a type of fatty fish which is rich in flavour as well as nutrition and it can be the ideal addition to your plate this week. 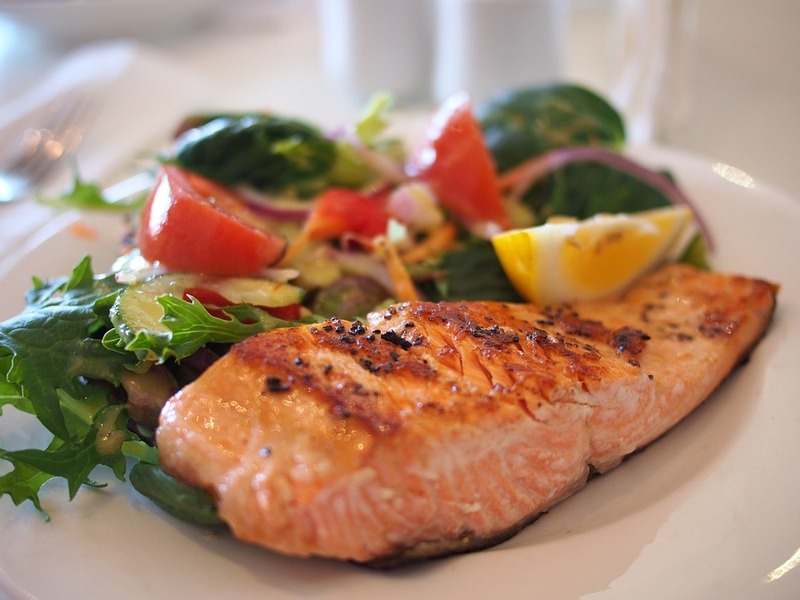 Today we are going to take a look at just a few of the amazing salmon recipes you can try to make for yourself and your family for a healthy and flavour packed dinner. Salmon is a rich and unique flavoured fish which complements a lot of different flavours, and one of the most amazing flavours we can pair with this fish is balsamic vinegar. This dish is ideal for a midweek meal because it can be made quickly and it is super healthy too. The beauty about this recipe is that you can use your favourite veggies, so feel free to swap out for your favourites. To start off, place the balsamic vinegar, garlic and basil in a pan and bring to a simmer. Let it simmer and start to thicken, and take it off the heat when it coats the back of a spoon. Next up place all the veggies on a baking sheet and sprinkle with salt and pepper. Bake for 20 minutes, turning the veggies halfway through. Add the salmon and bake for a further 20 minutes. Serve and drizzle over the balsamic glaze. Grilled salmon can be a wonderful dish to enjoy all year long and whether you do it on a griddle pan or on the barbecue it can be a great choice for the family. This is a simple dish which can be served with a baked potato or your favourite veggies. For this recipe you simply need to sprinkle your salmon with salt and pepper and grill for 10 minutes on a high heat. You can then move on and make the tzatziki by combining all of the other ingredients in a bowl. It’s the ideal summer dish and one which you can add to a party for some fun flavour and colour. Chinese food is always a popular choice for many of us and this week we have the ideal low fat option for you and the kids. Hoisin sauce is a sweet sauce which is ideal for anyone who wants a kick of oriental flavour in their meal. For this we can add some crunchy veggies and soft salmon for a balanced meal. Start off by soaking the garlic and raisins in water for 5 minutes. Add the tomato purée, five spice, peanut butter, soy sauce and white wine vinegar and blend until smooth. In a frying pan fry your salmon for 10 minutes with salt and pepper. Meanwhile add the sauce to the pan along with some noodles and veggies and stir fry for a few minutes. Layer onto plates with your salmon fillet on the top. This makes a great meal for a quick weeknight and it is something different which should encourage the kids to try some more vegetables in their diet. When it comes to cooking salmon there are a few flavours which go amazingly together and for this, lime and coriander are definitely the stars of the show. If you want to make an impression at your next dinner party you can try baking this salmon dish and serving it with a host of other side dishes. For this dish you will want to start off by mixing the marinade ingredients in a bowl. Once you have done this you can place some foil onto a baking tray and make a small packet for your salmon. Pour the marinade over the salmon and cover, then bake for 15 minutes covered, then uncover for the last 5 minutes to allow the marinade to become a little sticky. While the salmon is cooking you can look at preparing a fun salad with some of your favourite veggies, ours are just a simple suggestion for you. Play around with fresh and simple flavours and this will allow you to make the perfect dish for a simple Monday meal. For an easy week day meal to please the family this is the ideal choice. Simple flavours and your own choice of veggies make this meal perfect for the family all year long. For the sweet potato mash, you can start off by piercing holes into a potato and then placing it in the microwave for 8 minutes to soften and cook. Once it is done, place in a bowl with butter and mash. Add salt and pepper for seasoning. For the salmon, place it onto a baking tray with your herbs and paprika, salt and pepper and bake for 15 minutes. Serve together with some winter veggies such as broccoli and carrots for the ideal warming meal. There are lots of amazing meals you can make with salmon this year and you can really play around with different cooking styles and flavours to make your meals the best they can be.